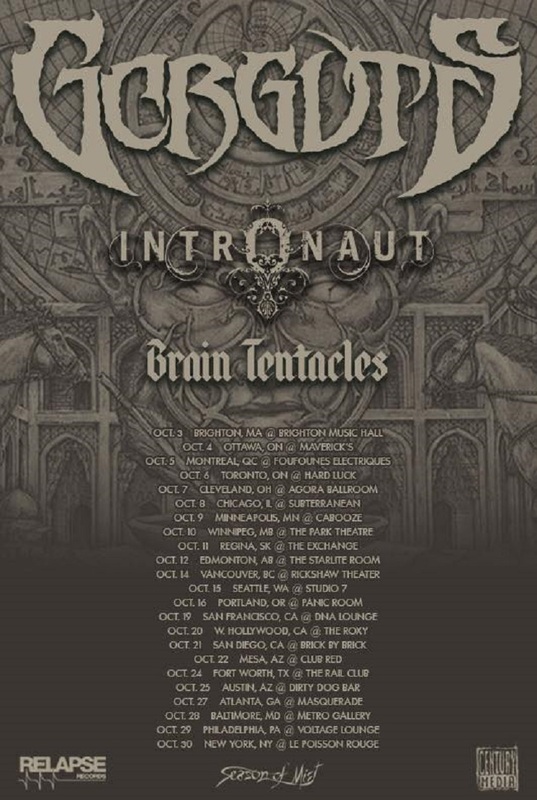 After sharing the destructive, epic Pleiades' Dust this spring, Quebec death metal deities Gorguts have announced a fall North American tour. The progressive punishers will kick off the trip in early October and will be travelling alongside tech-styled stoners Intronaut and U.S. mind expanders Brain Tentacles. Though the Canadian combo's headlining trek begins in Brighton, MA, the month-long journey has them hitting venues in Montreal, Ottawa, Toronto, Winnipeg, Regina, Edmonton and Vancouver. You'll find the full show schedule down below. As previously reported, Gorguts presented Pleiades' Dust as a 33-minute, uninterrupted piece that mixed death metal brutality with more ambient textures. Founding frontman Luc Lemay's lyrics weigh in on the Islamic Golden Age, libraries and the dissemination of knowledge throughout the years. "If I didn't have a topic that fascinates me, I would rather do an instrumental record because the lyrics are very, very, very important to me. And I like to educate myself while writing the lyrics," he explained to Exclaim! earlier this year. "Before I did Colored Sands, I didn't know anything about Tibet, I didn't know how they founded the Dalai Lama, I didn't know about all of the conflicts. So it's a great way to learn as well, and then when a topic really fascinates me, I read as much as I can about it."